For the past 8 years since my father died on the eve of Christmas, I never looked forward and had as much fun in a Christmas as much as I did this year. Despite the distance from GenSan where my brothers and the feeding program for the street children is and the distance from Kuwait where my mother and the whole family are, everything is alright with my world. Of course we do celebrate Christmas in the past 8 years and there was this Christmas with the whole family back in 2006 but I never had until now a what I can only call - Traditional Christmas. Traditional Christmas for me is scurrying about because your god childs (inaanak) are coming to kiss your hand and of course asks for their Christmas gifts. Where children and adults alike are scrubbed clean, wearing their newest clothes and smelling so good. It is when Christmas Tree is surrounded by gifts, to be opened on Christmas day. IT doesn't matter if it only contains a hundred peso worth of item. It's the thought that counts and ripping the wrappers. Christmas is when the whole family cooks, cleans and prepares together for the much anticipated Noche Buena. Even if it is only spaghetti and buko salad, one will still feel so full. Braving midnight mass despite the cold, the mad rush of commuters and drowsiness. Christmas is jam packed malls and highways because of last minute shoppers. It is sharing what little Noche Buena you have in tupperwares to your neighbours and friends. Being invited to almost all your neighbours houses since the time you wake up for breakfast lunch or dinner. Singing karaokes, seeing drunks swaying on the streets, blaring christmas songs and getting startled by fireworks thrown by naughty children. Christmas carolers, mostly children with their self made musical instruments, going house to house and shouting "patawad" (we apologize) after the 16th group. I've never observed all this Christmassy traditions for a long time until now, here in Manila, far away from my family and my comfort zone. Metro Manila celebrates their Christmas the chaotic way and I say it in a very fond manner. The past 2 days I have been a silent obesrver and saw a lot of things I haven't seen in a long while. It made me feel melancholy for those childhood memories and it made me long for my family and it made me want a better Christmas for all of us for the coming years. I am having a great Christmas with friends here in Manila. My brothers are having a great time with the extended family in General Santos City. The oldpeople, my sister, aunts and cousins are all I'm sure having a fab party in Kuwait. 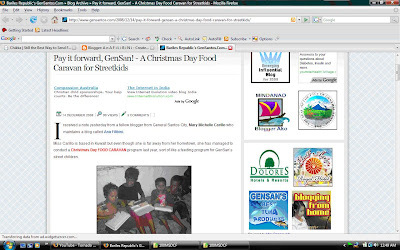 I will not be able to join the "Pay It Forward Gensan 2008" feeding program for the street children of General Santos City this year. A call from Kuwait changed all my Christmas plans. I was instructed to fly out to Metro Manila immediately as my Kuwait visa has finally arrived after 5 months of waiting. I needed to see my Agency who will instruct me to report to GAMCA (Gulf Accredited Medical Clinics Association) for my medical before I can finally fly out to Kuwait. I was exhilarated for just about a second and then I remember my 2 brothers who's going to spend Christmas on their own as the whole family is now in Kuwait. I immediately went to their room where they asked me what's up and corny as it may sound, my tears rolled down to my cheeks. I'm a cry baby yes and more so when it comes to my family. It doesn't even matter if I get to see them every year and cry every time it's time for me to go. I finally understood why my mother, during her vacation from Saudi Arabia, would call all 4 of us on her bed and then she would just quietly hug us tightly. In between sobs she would remind us to be good and study hard and to write to her everyday while she's away. I didn't want to leave them all alone in GenSan for Christmas since my Grandmother was a Jehovas Witness and would frown upon anything "Christmasy" in our compound. For awhile we dreamt of a Christmas together here in Manila but soon put it off coz we realized it would be too expensive for the OldPeople. We finally decided for me to fly out and for them to spend it with their friends. Right now, I just finished my medical and boy do I have to post another blog for that. I'm not used to the hustle bustle of this Metro and I really miss the laid back life in Davao/ GenSan but one gotta do what one gotta do. My brother found a new hobby. Silkscreen T-shirt printing. He was so proud of it so of course I can't help but take advantage. I asked him to make us shirts for the food caravan. Together with my cousin, we were able to come up with hilarious slogans. I digress, shirt above is not hilarious. It's actually true. Nyahahahahahaha! That's my cousin's Christmas wish. She recently took the Nursing Board Exam, thus the print. We're going to make half a dozen shirts. This should be fun. Goodie Bags For The Food Caravan! The excitement for the "Pay It Forward Gensan 2008" food caravan goes up a notch everyday. I receive texts, YM's, emails and messages in Friendster from people who cheered and offered their support for this project. I am happy to say that one of the huge supporters are the "Old People"! Their donations are in these 2 plastic bags. Inside are the main staples for our menu! They told me that if only we have loads of money we'll feed the entire "batang tun-og" (children of the dewdrops? hahahaha!) ourselves. I told them, we all can start with one child and it will go from there. "2008 Christmas Tree Blog Parade"
I read this Christmas Tree Blog Parade from very famous blogista Kengkay and immediately wanted to join. 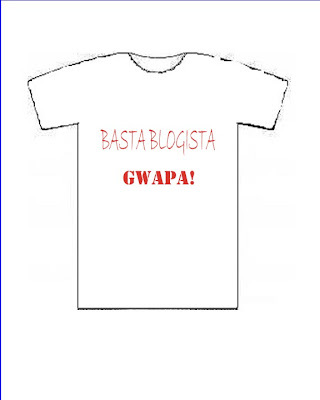 Kengkay's blog is so hilarious in an unassuming ways and that's why I read her entries everyday! I digress. Back to the Christmas tree. For this year's entry, I got a bit confused wether to post the Christmas tree in Kuwait or the ones we have in Davao. After much deliberation, I decided on the one in Davao because... well I was in Davao until recently. Hehehe. Our Christmas tree is artificial and all the ornaments are store boughts but the shrewed planning involves loads of creative juices that none of us in the house got. Our Christmas Tree in Davao, All Lighted Up! It was an old 4 feet artifical tree from last year that my mother bought for my brothers since most of the time we're in Kuwait and the brothers are left here because of their studies. To liven it up, I decided to buy artifical red Poinsettias ( I think they're really really pretty! ) and gold ribbonettes of different sizes. I also added yellow lights together with the old red and blue. A golden Angel with a harp sat on top of the tree. What's so special about my tree? Well it was all done with a sisterly love for my brothers whom I know will spend Christmas here in the Philippines all on their own. I made that tree in a mad rush because I wanted to surprise them when they get home from school. Granted they won't see the Tree all lighted up on Christmas day but I hoped that by just seeing it on their way out of the house, they could feel the festive spirit of Christmas. I realized everyone in the blogosphere must have posted one way or another about their Christmas trees but if you're one of those who hasn't, well here's your chance! Take a photo of your Christmas tree inside your house not smaller than the size of 500×375 pixel (for cropping purposes for the parade). It would be better but not required to at least take three different shots of the three (landscape, portrait and detailed shots). A whole body shot of the Christmas Tree is the most appropriate photo. And then post it on your blog entry. The link train will provide clue on “who tagged who” and at the same time a reference of data for the creator of this meme. On The feast of the Epiphany (Three Kings) on January 4, 2009 (The official ending of the Christmas Season), Bluepanjeet.Net will will feature all of the participant’s Christmas trees for 2008 with a link back to their site. 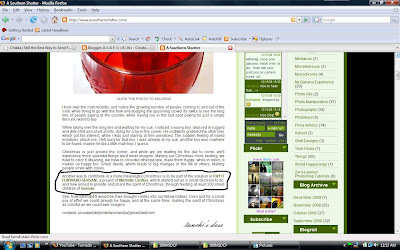 That is why it is very vital that you maintain the link history so that your Christmas tree will be included in the Christmas tree blog parade of 2008. 1) Christmas tree photos used last year cannot be used this year. Your Christmas tree photos should be current. 2) You can do this on your other blogs if you have two or more blogs provided that the people tagged on one blog should not be tagged on the second blog etc etc. each blog should have a different set of people to be tagged. So tag now, you only have one month to spread this meme. Misa de Gallo, according to Fr. Samson - Ateneo de Davao University's President and the presiding priest for the first day of "Simbang Gabi" this year, is a Filipino's unique gift from the Church. 4.30 a.m. mass at Ateneo de Davao's covered court. It has been 4 years since I last attended Misa de Gallo (Simbang Gabi) and this is the first time that I was keen not to fall asleep and really listen to the gospel. Today we asked our Lord to bless us, the Filipino people, during this trying times of our economy. That may we continue to strive and look for the positive side of everything. Father Samson also reminded us of our history on how the Church and the State, who once ruled together has now separated due to treaties. Political innuendos aside, he also reminded us that completing the 9 days of Misa de Gallo for a wish to come true is all well and good but let us not forget the true essence of this tradition, which is celebrating in anticipation Jesus Christ's birth. ADDU's covered court was full of devoted people, mostly students, alumnis and campus neighbors. I remember, when I was a student of this esteemed University, my friends and I would stay up all night drinking to keep our self awake walk towards the school (we live in a dorm a mere minutes away from the campus) and afterwards eat "Puto Maya" ( rice cake ) that's being sold outside the gate. I know that in Luzon area's "Puto Bumbong" was the ultimate after mass staple but I have to confess that I've never eaten nor seen a "Puto Bumbong" in all my catholic school girl history. Probably because it's not popular with the Visayan's although I was told that both are just a variation of the basic thing. Misa de Gallo is a tradition that most of us, young and old alike, Filipino's looks forward to. Not only does it makes our spiritual values alive it also brings us closer to our friends and family as we plan and walk towards the church, it makes us appreciate the traditional foods and most of all it makes us even more excited of Christmas. Christmas in the Philippines won't be complete without the Misa de Gallo. Within 24 hours since I posted the "Pay It Forward GenSan" feeding program, Bariles of GENSANTOS dot COM, the top blog in General Santos City, texted me to check out his blog. Until now, my heart is filled with happiness everytime I remember this blog post of Bariles regarding the program . Maraming salamat po in helping us spread the word and eventually the deed. Yesterday, I was awaken by a text message from Roxy of RD Corporation. By this time I was shivering with delight with the GenSan people. I've never solicited nor asked for sponsors, except within the family, ever before and when I read Roxy's text message, I don't even know what to reply to her. I figured it out eventually and to my amazement, Roxy of RD Corporation, turned out to be an old friend from Notre Dame of Dadiangas High School. It really is a small world. It was great hearing from you again Rox! I hope to see you when I'm in town and thank you! Lastly, last night, Tanchi of Monkey Monitor left a comment to my post that really made my day. He also mentioned me in his yesterdays entry. Sa inyong lahat; MARAMING MARAMING SALAMAT PO! The street children of GenSan will have a fabulous Christmas day because of you people. In lieu to my post below, I've decided to post this solicitation letter that I've started to circulate within the family and friends and now here in the blogosphere. The Christmas season is here where people of all ages celebrate thanksgiving and gift-giving. Carols from children and adults alike can be heard in this time of year. In line with this, Proud Art Entertainment will be having a Christmas feeding program for the street children of General Santos City on the day of the birth of our Lord itself. Entitled, “Pay It Forward GENSAN”, aims to share the spirit of Christmas to those who were not as lucky through FOOD CARAVAN all around Metro GenSan. We humbly ask for your donations which will be used for the fulfillment and success of our organization’s activity to be slated on December 25 after the 5 p.m. mass. If you wish, you can also join us in the Caravan and experience jubilation as you look at the delight in the children’s faces. Please check the boxes below on the amount you will donate. Rest assured that every amount you give shall be used for grocery, fuel and other staples to forward the cause of this organization. Pasta, rice, juice in tetra packs, vegetables and any other food donations are highly recommended. Last year we were able to feed almost 100 street children and wouldn’t it be wonderful if we could feed 200 children this year. I've battled with indecision about posting this for just about a year now. kids won't have to endure an empty stomach on Christmas day. Today, we paid it forward. All the blessings and the not so good things that the Almighty God bestowed on our 2007 was not left unnoticed. We are thankful of what we have and what we don't have. We realized that we were one of the lucky ones and it is our hearts desire to help out those who didn't faired well with life. Everyone goes home during Christmas day but what about those who doesn't have any home to go to? Months before my Christmas Holiday,the kids and I planned and asked our family to donate a little something because we wanted to feed the street children of General Santos City. I was so happy to see how eager my siblings as well as my cousins in this little project of ours. We have accumulated enough food for approximately 100 packages. We've cooked spaghetti, pancit, fruit and macaroni salads and we also bought tetra pack juices and just for kicks we bought Goldilucks chocolate cakes. After the mass and visiting our father's grave, we roamed around GenSan streets to look for street chidren. Boy weren't they hard to find. They were at Santiago Blvd in front of Dunkin Donuts and it looks like they're residing at the old and abandoned Kanto Grill. They were at Pioneer Avenue in front of Mercury Drug. They were at the now called "Tuna Park" wherein we saw a settlement of mixed B'laan's. Young and old alike asked for them but we have to insist about children's only since we only have 100 packages. While handing out these packages, our eyes were moist with tears and all the time we were sending thank you prayers to God for our good fortune. Their smile as they receive little of what we can give them is priceless!!! Some even insisted on doing a small dance number and singing Christmas carols number for us as their way of thank yous. From that night on, we decided that we're going to do this every year. This will be our tradition. Our way of giving back to everything we have received. We consider it as a blessing to be able to share. To get out God’s Word. Jesus Christ and His love. Yet our eyes have often drifted Away from our Lord! To help those less fortunate And lighten their load. Would listen, heed and believe. You’ll be changed on the spot. Sushal to the highest level. My missing gorgeous twin recently went to Hong Kong to attend the Clinton Global Initiative. The objective of CGI is " to promote innovative solutions to addressing hunger and malnutrition in Asia, especially children". As the Ambassador for UN World Food Programme Philippines National Ambassador Against Hunger, it's just fitting that she get invited and stand right next to Clinton in this prestigious event. The whole Pinas is so proud of her, hair flipping and all that. The Dream Match Spoiler? Google it! The Pacquiao - dela Hoya Dream Match is playing right at this moment at the tube thanks to GMA tv. Thanks to Google, I already know who won and on what round. I have the patience of a rat and so I can't fidget for hours waiting for the result. My brother is pestering me about the result coz he's been drifting in and out of sleep, sprawled on the floor, while waiting for the fight for 3 hours now and counting. I'd still watch the replay. I'd still feel the suspense and hold my breath in every thrown punch but not yet. It's just the first round. Right now, I'm listening to Britney Spears new album "Circus" which I love love love!!! Within 5 seconds since he last asked, my brother is now threatening me to spill. He thought I'm afraid of his uppercut. Pffft. Me strong. Me not afraid. Have to run now. Laters! We were told that it's a sign of aging when presented with a choice between getting drunk or eating and we synonimously agreed on foooooooood. I lived all my life in GenSan but i've never once tried Rancher Grill probably because back then I would've swam on a pool of beer anytime. The rustic ambiance are perfect for a romantic date or a family Sunday dinner. They baby back ribs are to die for but I recommend their seafood. The grilled Panga is simply fabulously scrumptious. The place has an old west feeling with their cowboy motif. We've also ordered this "forgot-the-name-of-that-meal-set-that-we ordered" but it includes, 4 cups of rice exluding the ones surrounded by viand, pork adobo, 4 roasted quail, guso (seaweeds? ), baked tahong, boneless bangus, shrimps and salad. All for only PHP 700 good for 4 persons or if you're on a diet, then more. I've never heard of a human beat box until I attended my best friend's exclusive party at GenSan last week. Beatboxing: The art of producing drum beats, rhythm, and musical sounds using one's mouth, lips, tongue, voice, nasal passage and throat. Apparently, it's a big thing and they even have their own Human Beat Box Website that posts new techniques, conventions and even competitions. GenSan is very lucky to have their home grown talent in human beat boxing in the persona of DJ Gore. Everyone at the party had their mouths open gaping at him in awe while he was doing his thing. He's really good and cheap that I recommend him to all of you GenSan people and Davaoenos to hire him to one of your parties. The Island Garden Of Samal is one of the best local and tourist attraction here in Davao City. With their numerous white sand beach resorts and the bat caves among other things makes it the likely get away place for most people. When I grow up, I want to own a beach front house to make as my little happy place. Tourists are not the only ones who appreciates the beauty that IGACOS has to offer. On our way home, I saw a group of bikers that I'm guessing likes the terrain of the island. At the Davao's Christmas Bazaar last night, I was surprised on how young the sellers are in most booths. When I got home and start surfing some of their multiply websites, I was even more amazed at their creativity, fashion sense, marketing skills and on their tenacity to conquer the fashion retailing world. Their websites are straight forward and easy to use/ navigate and their products are fun and quirky. They certainly knew how to tap the younger market and with their very affordable prices it's not hard to look like a fantabulous fashionista anymore. Below are the websites I managed to note last night. 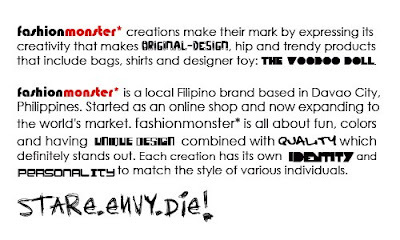 FASHION MONSTER is one of the Davao based retailers that cause me to stay up until the wee hours of the morning browsing their products I love these bags and their statement shirts! When I saw their Voodoo dolls and bags, I knew that sisterblister would adore it. These kind of gothic and eccentric designs are just her style. The statement shirts caught my attention as it's the "in" thing with my brothers right now. 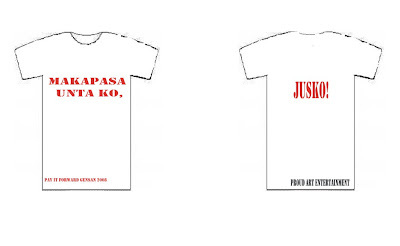 Personally, I love their Pilipinas statement shirts. It's like the Bayo designs but much cheaper. I saw these I Hate Plastic Bags at SunLab in Gaisano Mall and I've always been taken by them, although I've never gotten around to buying. RAINBOW PROJECT I actually thought the seller is from Davao but I guess they only got a booth at the bazaar last night wherein I stopped and browsed at loads of statements shirts that I love and emo sweaters for my brother but the sizes were a wee bit on a small side. Browsing their website though makes me all giddy inside. Aside from the usual fashyun stuffs, they also sell beauty products such as Epilin Hair Removal. It's a beauty product in my category because one can't go out into the streets looking like a hairy wild Gorilla. In the absence of sheera and indian wax/er, I've been buying this at Watsons or getting it done at the Hair Studio who also uses this product. For the face they have Tretinoin Cream. The description and usage information in their website is a bit too long for me so I'm still not sure if I should order and try it. I'll have to ask the skin expert for this, my mudra. and ODM and Levi's watches for a very low price. Looking at all of them makes me wish that I have an ounce of creativity in my body and wonder if any of them wants to branch out. Say..... franchising and exporting in Kuwait or uhm in GenSan? The shrewd brain cell in me is formulating a plan. SURF AND BUY NOW EVERYONE FOR ALL YOUR FASHION NEEDS AND IT'S ALSO A GREAT CHRISTMAS GIFTS FOR YOUR FAMILY AND FOES FRIENDS. I've been taking up walking lately around Davao, hoping to shed off some of these kilos gained from months of eating sisig and unlimited rice, and it's amazing what one discovers along the road. 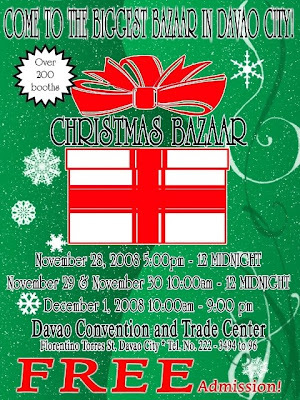 Such as this Christmas Bazaar at the Davao Convention happening this weekend! I saw it the other day when I went to Holiday Gym and Spa (reserved for another blog post) and my jaw dropped. I love bargain hunting! That's why despite the recession in my purse, I braved the rain, snubbed the Gaisano Mall midnight sale and went to Davao Convention Centre. As expected, it's retail therapy haven. I saw gorgeous shirts and dresses, outrageous home furnitures and little things I don't really need but want to take home with me such as the Team Manila wall clock where Jose Rizal's face was plastered in it. Friends told me not to buy since I can easily do my bargain shopping at Greenhills in Manila coz they're more likely to be exported from there and sold here in exuberant prices. Part of it may be right but some pretty and interesting booth displays caught my attention and when their banner indicates a multiply.com address I decided to just browse and maybe shop online which I'll be featuring on my next post! The number of people at the Bazaar last night could've fooled you that there's no recession at all. A friend commented on one family where Papa Bear took out wads of pesosesoses and gave it to the Mama and Baby Bears. Recession? What recession? On A Much Lighter Note: TAHOOOO!!!!! I almost jump out of the "pot-pot" (bicycle with side car used as public transportation - don't know the name in english) when I saw this man bending over by the side of the streets. He's a Taho vendor and those two big containers he lugs around his shoulders contains soya and tofu amongst others. I grew up eating taho although it was considered one of those potentially “dirty” street foods. It is healthy except for the sugar content, this high protein, low fat and low cost snack is delicious, nutritious and economical. Everytime I go on vacation here in Pinas, I have lists of foods and places that I want to try and see. Taho is one on the top list. Oh I'm a very happy little girl. It brings back fond memories. Taho is best eaten fresh and hot from the vendor or refrigerated for couple of hours for that soothing cold delight. Taho is just one of many soya products that have been dubbed as health food. Soya diet foods include silky, soft and hard tofu, beancurd skin, soybean paste, and soy ice cream, to name a few. High in protein, low in fat and absolutely low cost, soya products are staples of the Asian diet for ages. Now, the rest of the world are catching up on the yummy delights and health benefits of soya. Grind finely while adding boiling water. Put soybean in a cheesecloth and squeeze out milk. Boil soymilk for 5 to 10 minutes. Pass the mixture through a cheesecloth then put in a molder. Cool and serve with syrup and sago. Soak soya beans for 30 mins. in topwater. Soak the soya beans for 8 hours with generous amount of water. After 8 hours, grind the soaked beans as fine as possible(you can use a blender), then cooked it and let it boil in 180 degrees for about 20 mins. Then apply a coagulating powder. Stir one or twice until gel-like form is achieved. Boil sugar and water. Add lemon or vinegar and set aside. Grate ginger. In a sauce pan, combine ginger, water and sugar. On low heat, simmer and sugar to dissolve. Strain before serving. An alternative for ginger syrup is ginger powder which you can buy at grocery store. Make it about 4-8 times normal strength, add sugar to taste and simmer until the sugar is dissolved.